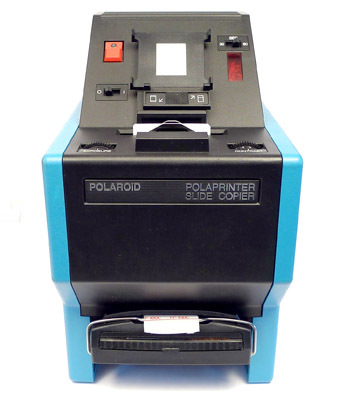 for duplicating Polaroid pictures to do image transfers. 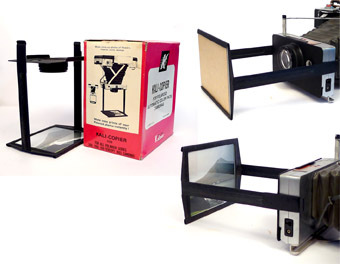 >> was very common system in the 70's - 90's for making good quality polaroid copies from 35 mm slides and experiment with image or emulsion transfers. 3) The Close-Up camera CU-5 3"
POLAROID CU-5 MACRO CAMERA 3"
For 1:1 ratio macro photography. The Polaroid CU-5 is a professional fixed focus camera designed for close-up and macro photography. The Tominon f4.7 75mm lens, stopping down to f45 is housed in an unnamed (possibly Copal Polaroid) shutter, with speeds from 125th to 1 second, plus 'B' and 'T' settings, with cable release. It has a built in ring flash and PC socket. The removable Polaroid type 100 film back has a built in darkslide and an accessory shoe. Extension tubes could be fitted between the lens unit and the film back. The film back has a tripod socket designed to fit the dedicated pistol grip. 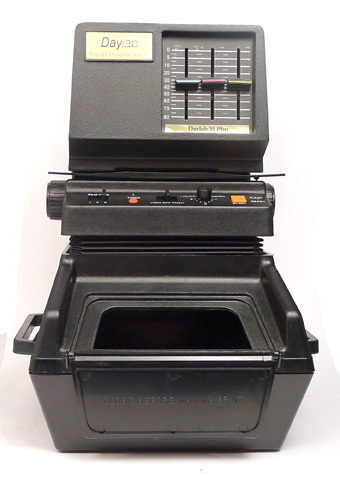 The aperture and shutter speeds are hidden from the user underneath a cover marked '3" Polaroid CU-5'. This cover has two settings, for 100 and 3000 ISO films. Opening this cover shows all the aperture and shutter speed settings, as well as the cable release; the shutter release is a trigger-like lever on the bottom of the lens unit. >> With the availability of good inkjet printers and archival matt paper, the CU-5 offers the best option of taking 1:1 Polaroid copies of an matt photograph and so experiment with image or emulsion transfer of Polaroid or Fuji packfilm. For 1:1 reproductions of Polaroids pictures. 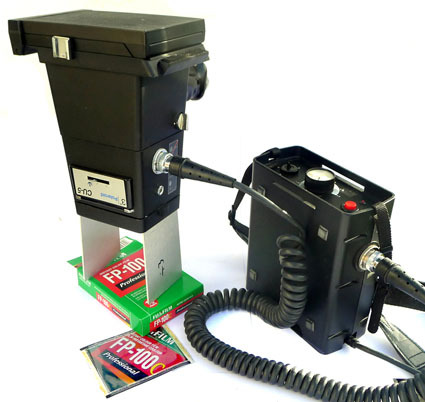 FUJI IMAGE TRANSFERS ARE MADE BY ABORTING THE DEVELOPING PROCESS OF THE FP-100C POLAROID PICTURE AFTER 30 SECONDS AND TRANSFER THE STILL DEVELOPING IMAGE IN SEMI-DARKNESS ONTO VELLUM (HOT PRESS) PAPER WITH ROLLERS FOR 90 SECONDS UNTIL FULL DEVELOPING TIME IS ACHIEVED.